Click to listen to episode (2:49). From the Cumberland Gap to the Atlantic Ocean, this is Virginia Water Radio for the week of August 26, 2013. This week, we feature a music selection inspired in part by one of Virginia’s largest and most distinctive riverside plants. Have a listen for about 40 seconds. You’ve been listening to part of “Sycamore Rapids,” by Timothy Seaman, on his 2002 CD of the same name, from Pine Wind Music. The tune’s progressions are meant to signify changes a paddler might experience from small riffles to larger rapids to smooth water. At any of those water features, throughout the eastern United States, part of a paddler’s scenery is often the American Sycamore tree. 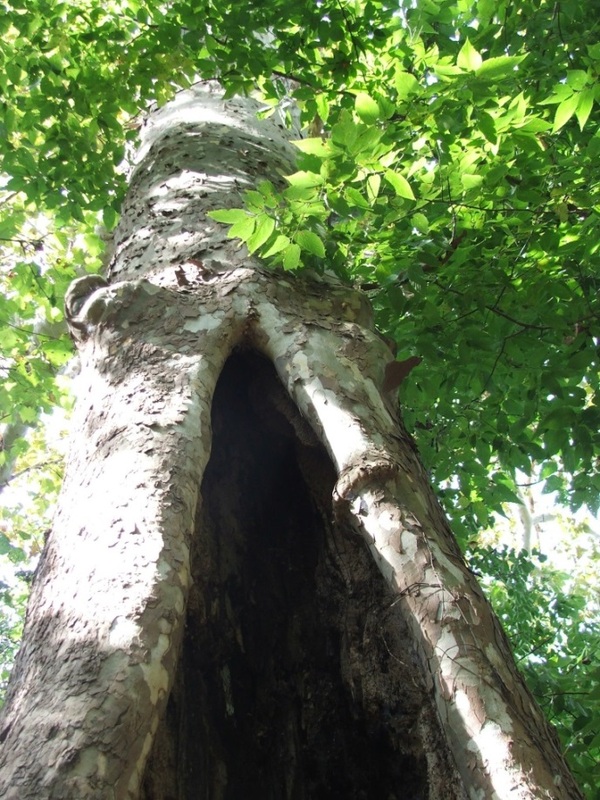 Of the three sycamore species native to North America, the American Sycamore is the most familiar and by far the most widespread, ranging from New England to eastern Texas, including all of Virginia. 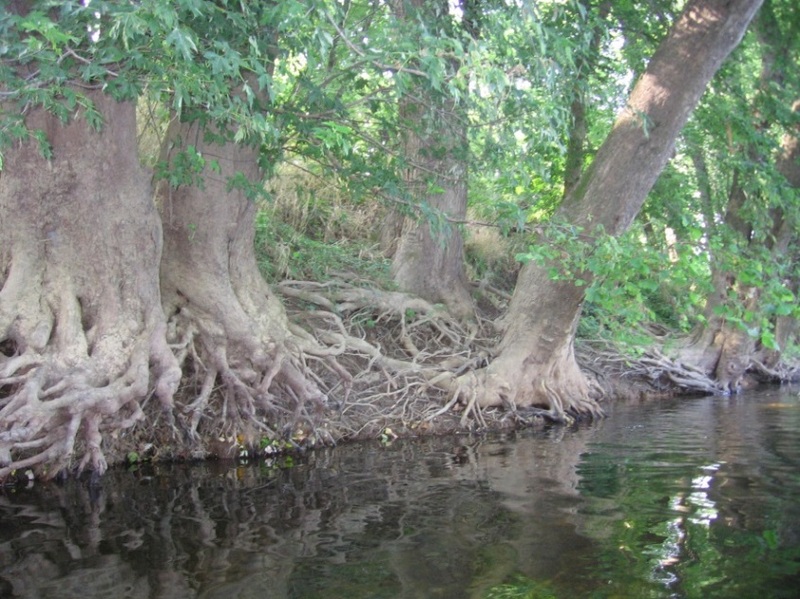 This tree is common in flat, floodplain areas beside small streams as well as big rivers. 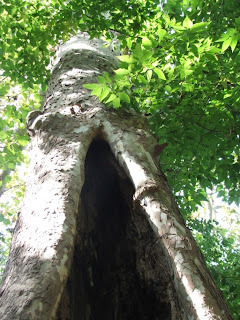 Some of its distinctive features are large, often hollow trunks; peeling, patterned bark; crooked limbs; large root masses visible along stream banks; and spherical fruits persisting on leafless twigs long into winter. 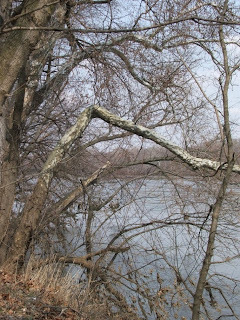 Whether seen from a boat or from far upshore, few trees mark a waterway any better than a sycamore. Thanks to Timothy Seaman for permission to use this week’s music and for information on its origin. Hollow trunk of American Sycamore beside the New River in Radford, Va., October 4, 2009. Sycamore roots along the James River near Wingina, Va., along the Nelson-Buckingham county line, July 12, 2009. Sycamore along the Loudoun County, Va., side of the Potomac River, near White’s Ferry, March 23, 2008. Acknowledgments: “Sycamore Rapids” is copyright 2002 by Timothy Seaman and Pine Wind Music, used with permission. Mr. Seaman’s Web site is http://www.timothyseaman.com/. Sources: Information on the American Sycamore (Platanus occidentalis) was taken from the following sources: Common Native Trees of Virginia, Virginia Department of Forestry (Charlottesville, 2007); Audubon Society Field Guide to North American Trees-Eastern Region, by E.L. Little (New York: Alfred A. Knopf, 1980); and “vTree Factsheets,” Virginia Tech Department of Forest Resources and Environmental Conservation, online at http://dendro.cnre.vt.edu/dendrology/factsheets.cfm.